Imagine this: You’re sitting with your friends in the cafeteria. Everyone is laughing, complaining about the school lunches, and copying each other’s homework. Then you show your friends how you changed your Instagram profile picture to a parody of the Starbucks logo. They all chuckle. You quirk your head. Hannah from across the table says, “Oh my god, you’re so white!” Everyone else nodded. Hmm, you think. Hannah goes on: “Think about it– your fashion sense, Starbucks logo, straight A’s– you’re the whitest girl at the table.” You squirm a bit in your seat. Nothing she said was untrue, except for one small detail– you’re black. Yeah, that happened to me in eighth grade. Looking back, I know my friends didn’t mean any harm, but I find all the implications of their words very troubling. Saying that dressing well and caring about grades makes me “white” implies that black people do not do those things. I am sure they didn’t mean it that way, but that’s the problem. People, often those who don’t mean to offend, think and talk about racial behavior in binary ways: you act “black” if you only care about sports and rap music, and you act “white” if you care about school and have a strong work ethic. That is the type of ignorance that I tend to face. I feel that there is some information I need to make clear. No, I am not a member of the upper class. No, I am not a legacy child who could coast through life on her family’s name alone. Both of my parents emigrated from Cameroon to America for a better education. And in spite of how high I aim or how hard I work, I highly doubt that I will be a millionaire. 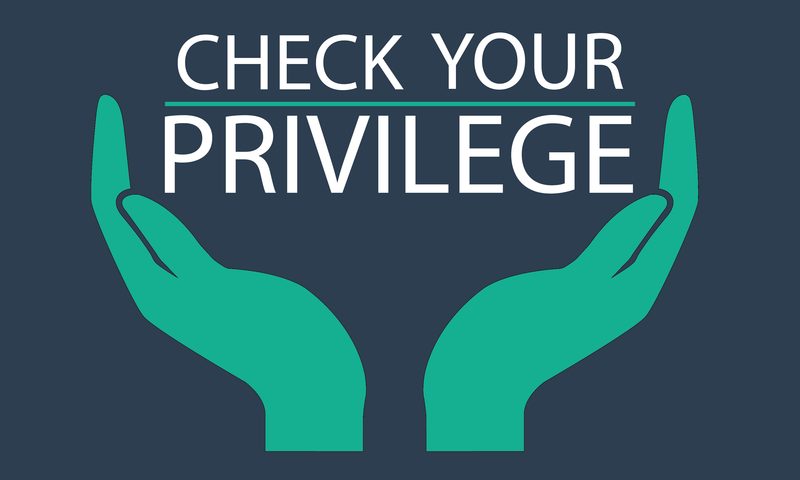 But for a black person in America, I know I’m privileged. I live in a nice two-story house– three if you count the basement– in a safe neighborhood, learn in one of the wealthiest school districts in the country, and have been able to vacation outside the country multiple times. I do not say any of this to brag; it pains me to know that many things in my life are still considered luxuries and not a given. I provide all this background to show that not every black youth is a disadvantaged kid in an inner city, which President Trump fails to recognize. Nor do I have much stake in which party is in power compared to those less fortunate than me. Most importantly, I want to demonstrate a nuance that is often missing in our discussion of race. That conversation I had with my friends reminds me of “The Danger of a Single Story,” a TED Talk by Nigerian author Chimamanda Ngozi Adichie. The message of her speech was that ignorance affects all us, even the most tolerant among us, and the way to combat is by engaging with the others and understanding the things that make us different and similar, rather than making assumptions based solely on what we see and hear in our environment. And I could not agree more with her point. For so long, I felt trapped by the stereotypes that come with being black. I do not fit the media’s perception of the African-American teen. In a lot ways, I am thankful for not experiencing the same struggles that impede members of my race like low quality education, the school-to-prison pipeline, and poor infrastructure. My experience is no Charlottesville, but I think that ignorance can be just as harmful to our society. It creates misunderstanding and allows even well-meaning people to believe in stereotypes and act accordingly. This misunderstanding leads to tragedies such as police brutality, where those who are supposed to serve the community react in the heat of the moment based on fear and assumption. Why did Tulsa police officers, thousands of feet away in a helicopter, determine that Terence Crutcher “looks like a bad dude” who “might be on something” even though he was obedient? Why did Harry Houck announce that African-Americans are more prone to criminality on CNN? It’s those base assumptions that lead to dire consequences in our relationship with each other. There is more to racism than the KKK. We need to question our innate thoughts and feelings for each other to create a truly more tolerant society. First of all, congratulations on an excellent commentary which stands above many I’ve read on the HS Insider website. Second, consider what your friends were saying to you, and consider what might happen if you were less strong willed. There is great pressure to conform to what peers expect of you, and they sometimes demand conformance in damaging ways. In this case, they have their own idea of what being black ought to mean, and it means — to them — a certain manner of dress, a certain amount of scholastic aptitude…. Perhaps that is driven by the negatives you describe about the environment — but Hannah, the person across the table, has had exactly the same educational experiences and environmentals that you have had, and yet, there’s something you are doing that she is not. Why? Could it be that your parents are a positive in your life? Could it be that you have found role models and motivation outside of the local community? She and her peers have a certain idea of what blackness entails, and you are orbiting outside of whatever planet those people have constructed. You always will do so, unless you succumb in college to the pull of alcohol, or drugs, or revolution. You are in the orbit which might produce a Condoleezza Rice, a Clarence Thomas, or a Barack Obama. Of the aforementioned, each of which has held or holds high government office, and each of which has been accused of betrayal of blackness, the one closest to you would be Condi Rice — who attended the 16th St. Baptist Church in Birmingham and who lost several friends when the church was bombed during Sunday School. She was certainly black enough that the KKK would have delighted in her demise, but she grew up to become President Bush’s chief advisor on Soviet and Eastern European Affairs on the National Security Council, Secretary of State, Provost of Stanford University, and now “merely” a Professor of Political Science at Stanford. She had decried what you have decried about injustice, and has done so in many locales. Note her takeaway ideas — that everything of importance will always be “a work in progress” and that if you want big things to happen, the little things like developing and keeping open lines of friendship matter — for it is easier to ask a friend to do something important to you than a stranger. These are interesting ideas, and if you live to the age of 65 as I have, you will have found application for them. So, education is the way out of poverty, but in leaving poverty — an essential element of blackness in the view of your friends — you leave behind a certain amount of blackness (in their eyes). But do you do so in the eyes of your parents? BTW, one of the primary reasons people in poverty (including blacks) are doing poorly in school is due to SUMMER VACATION. It turns out that children of means (such as, apparently, yourself), can even gain educational skills during summer vacation, because your parents’ means enable you to have educational experiences your impoverished peers cannot have. They lose critical skills during summer because of the lack of educational opportunities, and that may well be the nexus of their resignation/hopelessness in relationship to what they consider to be traditionally black. Think on that. At some point, you may be in a position to do something about a custom rooted in European agriculture — the idea that minds are like wheat fields and should lay fallow for a bit.